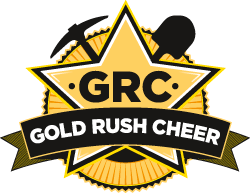 Here at GOLD RUSH CHEER we are committed to giving each athlete a positive experience, helping them grow into cheerleaders and individuals. We believe that getting to know each individual athlete and helping them set and reach goals, learn the value of commitment and teamwork. We want our athletes to not only have pride in their own accomplishments but help others to achieve theirs and be proud of our entire GOLD RUSH family. Our head coach Allison Sack started coaching in Hertfordshire, England 2002 for a charity organisation called MBA, from working in schools, youth clubs, mentoring and coaching competition squads. Allison helped many athletes reach their goals including winning trophies at nationals, completing qualifications and assisting the MBA being awarded the Queen’s Jubilee Award.